One of the greatest things in life is sharing food. For example I love sharing plates, communal tables and banquet style meals. But sometimes I like to have my own. Yes a grand pavlova gracing the dessert table is divine, but so is having a smaller one I can call all mine. In fact the only thing in my world which beats pavlova, is my own individual pavlova. So continuing along with my obsession of meringues and pavlova, here is another recipe I have been testing and given the thumbs up. What could be simpler and more sublime a dessert than egg whites whisked with sugar into little dreamy fluffy peaks then baked, crunchy on the outside and soft and pillowy in the middle? Team these beauties up with cream and fruit and it’s an instant swoon. Now when I say individual pavlova, I don’t mean the snow-white overly dry meringue nests in a cardboard box you buy at the supermarket. I’m talkin’ home made, messy, imperfect mounds you plop out onto a baking sheet and form with your fingers and the back of a spoon. I love watching these go into a hot oven and go all puffy and gorgeous with the promise of the delightful crunchy sweetness to come. The aim here with these particular individual pavlovas is not to get a snowy white meringue, but one that is caramelized and has turned a very very light brown. Every good meringue recipe needs a delicious topping to go with it and preferably one containing fruit. The sauce in this recipe is so easy it’s almost embarrassing and it teams so well with the lightly spiced cream and the meringues that I challenge you to stop at just one. I love to serve this sort of thing at a dinner party or BBQ where guests can dress up their own desserts. Just pile up a mound of meringues on a platter with the cream, sauce and fruit in beautiful bowls on the side and let everyone go for it. It’s always a hit. Makes 10-12 meringues. Prep time 20 minutes, cooking time 60 mins. 1. Preheat oven to 220˚C (approx 420˚F) and line two large baking sheets with non-stick baking paper. 2. Beat your egg whites with a mixer until they start to form peaks and add half your sugar one tablespoon at a time making sure it is well incorporated into the egg white. Add the cream of tartar, mix to combine then continue adding the remainder of the sugar until the egg whites are all stiff and glossy. 3. 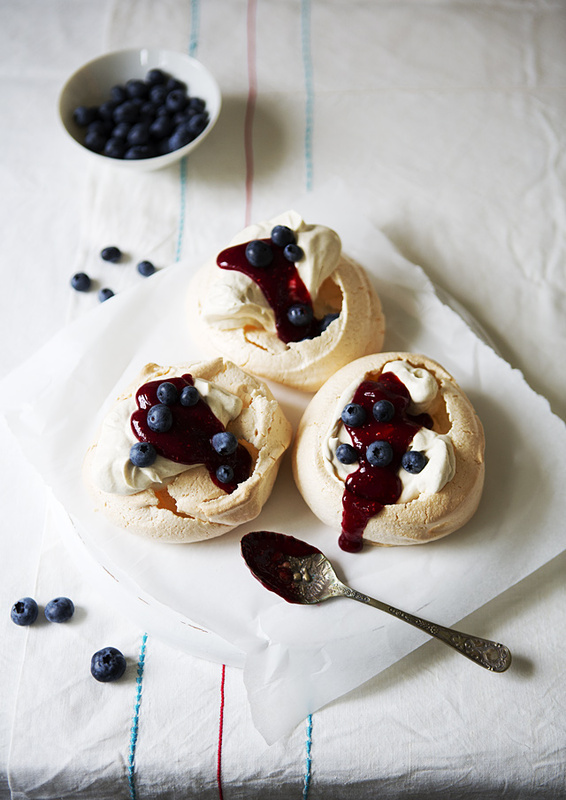 Place spoonfuls of the raw meringue in large dollops on the baking paper using a metal spoon. Place in the hot oven for 2 minutes, the meringues will go a light brown then turn the oven down to 120˚C (approx 240˚F) and bake for one hour. Turn off the oven and leave meringues inside until oven is cold. 4. Pour the thickened cream into a medium size mixing bowl and add the vanilla and cardamom. Whip until stiff peaks form. Makes about a cup. Prep time 5 minutes, cooking time 25 minutes. 1. Place the raspberries into a small heavy base pan with the sugar and Cointreau over medium heat and put the lid on. Cook for a few minutes, then take lid off stirring and breaking up the fruit with a wooden spoon. The fruit will get soft and break apart easily. Cook for 15 minutes, simmering on low heat to reduce the sauce and make it thicker. 2. Push the sauce through a sieve to remove as many seeds as you can. I find doing this with a metal tablespoon does a good job, some seeds usually still slip through the sieve and this is ok. If you find the sauce is still a little runny you can put it back on the stove to reduce it further though it does usually thicken upon cooling. 3. Take a meringue, dollop with cream and drizzle the raspberry sauce over. Top with the fresh fruit and enjoy. I wanted this image to be snowy and ethereal, much like the dessert, with a little bit of drama from the fruit and sauce. The surface is a vintage bed sheet from my local Goodwill (the source of many a prop for this blog) as is the vintage jam spoon and Japanese porcelain bowl holding the blueberries. The board the meringues are resting on is the top off an old timber bar stool sanded and painted matte white (courtesy of a Freshwater resident who put it out in hard rubbish council clean-up). It was photographed on a very dark cloudy day and the light coming through the window was surprisingly dramatic. Last month was the first time I ever baked pavlova.. and I have been hooked to that dessert ever since. Have had my mind on individual pavs for a while.. am waiting for mangoes to hit the market.. these look beautiful!! These pavlovas look so good! Truly delicious, love the sauce and the blueberries. These pavlovas sound beyond delicious, and the toppings complex (in the best way! ), and your food setting is perfect, you definitely captured the ethereal-ness of the pavlovas, and it does look dramatic! What type of lighting do you use? Tanya how refreshing it is read your blog, great sauce idea and love the spice cream. I love pavlova, I love meringue and I love raspberries. These little darlings will attend a dinner party at my place Friday. Looks lovely! These Pavlovas are so pretty: light and fluffy! Pinned! Your pavlova looks fluffy and beautiful! and I love your photo too!